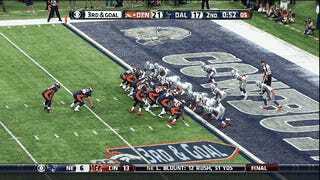 All 11 Cowboys swarmed Knowshon Moreno and forgot about Peyton Manning, allowing him to shuffle his way into the end zone for his first rushing touchdown in five years. Look at his little fist pump! So happy.